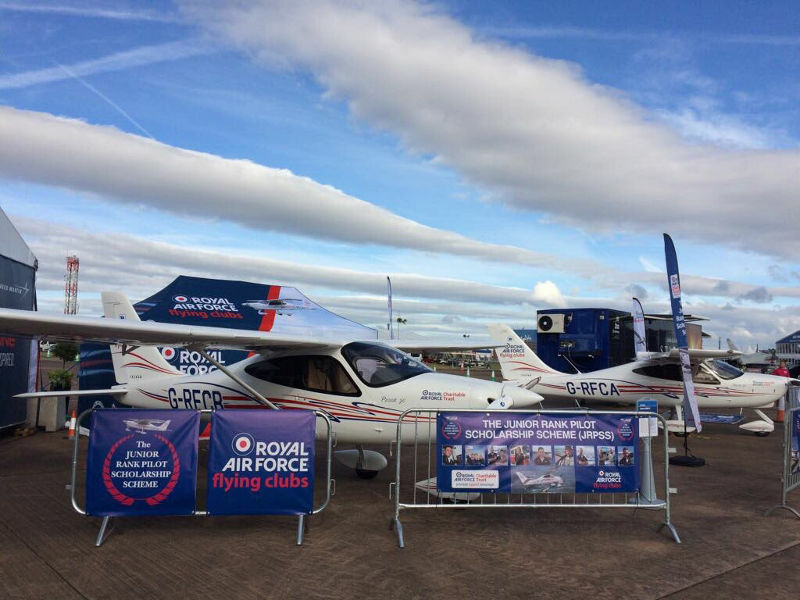 200 members of the RAF Junior Ranks have applied for one of 30 flying scholarships funded by the RAF Charitable Trust and operated by the RAF Flying Clubs’ Association (RAFFCA). The potential scholars, all of whom must be under 25 years old, could have the opportunity to undertake 15 hours’ flying training on a light aircraft. The scholarship also enables successful applicants to learn about Air Law, Meteorology and Navigation, helping them go from zero flight experience to flying an aircraft solo as pilot in command. All necessary equipment to undertake the training at selected RAF flying clubs will also be provided through the scholarship, including flying suits and study packs. Following a recognised syllabus, the training may count towards the award of a Light Aircraft Pilot Licence. To apply, Junior Ranks had a two-month window to complete a lengthy online application detailing their knowledge of, and passion for aviation. Last year – the year of the RAF’s centenary – the scheme celebrated its 100th Scholar, SAC Seb Ayling achieving solo flight. Seb said: “The JRPSS has been a life-changing experience for me – I cannot thank the RAF Charitable Trust enough. The feeling of being in the air is nothing like I have ever experienced and being the ‘100th Solo’ in the RAF’s centenary year was the icing on the cake”. The Trust’s mission is to promote the Royal Air Force, support its people now and into the future and encourage air-mindedness and the aviation-related education of youth. Director of the Trust Justine Morton said: “The scheme is an initiative run by the RAFFCA that embodies our mission to get young people interested and involved in aviation. “The Trust recognises that although JRs operate in an environment surrounded by aviation, there is little opportunity for them to actually get into the air. Not only does the JRPSS provide them with the support they need to get airborne, but it also ignites desire and enthusiasm for personnel to learn more about aviation”. The thirty successful applicants will be notified in March, before shortly beginning their training at their nearest RAF flying club. Upon completion of the scholarship, candidates can also apply to the prestigious JRPSS Top-Up-Scheme which provides additional funding for a select number of applicants to continue their flying training and gain their Private Pilot’s Licence. For information on next year’s scholarship, visit www.jrfly.co.uk. Modelling fans from across the Midlands are invited to attend one of the region’s largest modelling events, taking place at the Royal Air Force Museum Cosford on Sunday 7th April 2013. Nestled amongst a world-class collection of aircraft and military vehicles, thousands of intricately detailed models will be displayed alongside many of the real aircraft for the annual Shropshire Model Show. This year Airfix will be attending the show and launching their brand new 1:72 Lancaster model kits, which go on sale for the first time worldwide to visitors at the Shropshire Modellers’ Show. A specially commissioned display, including 19 Airfix model Lancaster’s, a Wellington bomber, and Photo Reconnaissance Spitfire, depicting the Dambusters Raid will be a focal point at the show. These have been kindly donated by Airfix and built by members of the Shropshire Modellers’ Club. This bespoke Dambusters diorama will remain on display at the Museum throughout April and May, marking the 70th Anniversary of the Dambusters Raid. With everything any dedicated modeller could want or need, all in one place, thousands of visitors are expected to attend the one day show. More than 80 modelling clubs from across the UK will be exhibiting their pint sized models which have taken hours of dedication to perfect. Plus, it’s not just models of aircraft that will be on show, there will be hundreds of cars, bikes, trucks and science fiction items including Dr Who and Star Wars. In excess of 40 traders will be selling a range of modelling materials and kits to suit modellers of all ability’s, from young children who are just discovering their passion for modelling, right through to the avid modellers who have been building kits for many years. There will be everything from plastic kits in various sizes along with glues, paints and other detailed sets available to purchase on the day. “I am particularly delighted that, for the first time in the history of this show, the world famous kit manufacturer AIRFIX and their sister brand HUMBROL will be in attendance, along with the person who creates their box art. This year the show will feature a special Dambuster anniversary display featuring 1/72nd scale models of all 19 Lancasters that took part in that famous raid, and I thank Darrell Burge for providing us with the kits. There will also be a model of the Wellington Bomber which carried out the trials for the famous bouncing bomb, the Spitfire which carried out reconnaissance sorties before and after the raid, and some anti-aircraft guns to show what the aircrew were up against. To make reaching the Museum even easier, organisers have introduced a free park and ride for the day to cope with the additional visitors. The show will be open to the public from 10am until 4pm and entry to the show is free of charge. For further information, please call the Royal Air Force Museum Cosford on 01902 376200 or visit the Museum website at www.rafmuseum.org. The RAF Cosford 75th Anniversary Air Show is pleased to confirm the attendance of the Royal Air Force Battle of Britain Memorial Flight to the event on Sunday 9th June. The BBMF preserves the heritage of much loved RAF World War II aircraft and stands as a poignant reminder of those who have paid the ultimate sacrifice in conflict. The Memorial Flight consist of Spitfire, Hurricane, Dakota and Lancaster aircraft, all of which are scheduled to make their way to RAF Cosford as flying and static displays on the 9th June and will be sure to perform an awe inspiring display. In addition to the RAF BBMF, Cosford will welcome back an old friend of the Station in the form of civilian owned Spitfire PRXI serial number PL965. Built at the Aldermaston factory in mid-1944 as a photo reconnaissance aircraft, she was designed to operate at high altitudes of over 30,000ft as well as at high speeds in excess of 400 mph. She was allocated to No.9 Maintenance Unit, RAF Cosford on 1st October 1944 for installation of service equipment and the Air Show is delighted to welcome her back this year as part of the packed flying programme. Visitors to the event will have the opportunity to marvel at the historic icons, alongside a number of current RAF aircraft including the Typhoon, Tucano and the famous RAF Red Arrows, during the flying display lasting over 5 hours. The organisers this year have also introduced several new hospitality enclosures for the 2013 Air Show aimed to enhance the visitor’s experience. For details of the range of packages on offer to suit all requirements and budgets, please visit the air show website www.cosfordairshow.co.uk. As the list of exciting displays and attractions starts to build momentum, RAF Cosford Air Show will begin selling tickets from public outlets on Wednesday (March 6). Ashley Claber-Aikman, from RAF Cosford Air Show (pictured left), handed over the tickets to Dianne James, manager of Midland Air Museum (Coventry), one of the many outlets that this week will begin selling tickets to the air show on Sunday, June 9. The announcement follows confirmation that RAF Cosford has been nominated to feature within the 2013 display season for the Royal Air Force Aerobatic Team, the Red Arrows. Last year more than 38,000 people attended the air show and organisers are anticipating another bumper turn-out at the West Midlands’ largest aviation event. Event organisers have tried to make it as easy as possible for the public to purchase their tickets to the Midlands’ premier aviation event. As well as the Midlands Air Museum, tickets can be acquired from the RAF Museum at Cosford, Tourist Information Centres in Stoke-on-Trent, Stafford, Solihull & Shrewsbury and selected branches of Midcounties Co-operative. Alternatively, people can choose to travel by rail and enjoy combined travel and admission when travelling with Arriva Trains Wales. Air show tickets can also be purchased online at www.cosfordairshow.co.uk or by calling the 24-hour ticket line on 0871 230 1083. Advance tickets are priced from £20, representing a 20 per cent discount on tickets bought on the day (£25). There’s FREE car parking and FREE admission for all under-16s accompanied by an adult. Early in 1963 a British-backed military campaign got under way, fighting to save three future South East Asian Tiger Economies from Indonesian expansionist aggression. For nearly four years, British and Commonwealth armed forces were embroiled in conflict on the island of Borneo. For the large part, this remarkable example of British military success was kept in low profile by the governments involved, however Singapore, Brunei Darussalam and Malaysia are three Commonwealth countries that the Borneo Boys’ exploits helped save in the 60’s. Borneo’s difficult terrain and lack of adequate road networks proved to be one of the biggest challenges from a military perspective, a challenge met in great part by the mobility of the helicopter. The helicopters worked in close support of Claret Raids – cross-border clandestine operations carried out by SAS, Paras and Gurkhas. These proved a key to success and the Malaysian Federation came into being 15 September 1963 (though the conflict lasted until 17 August 1966). What makes this story even more remarkable is that the RAF helicopter pilots were in their early 20’s and low in number. There were 16,000 British & Commonwealth troops at the peak, serviced by no more than 75 helicopters (by comparison, in Vietnam the Americans and their Allies had close on 3,000). This unique part of British military history is now uncovered in a new book written by one of its Veterans and featuring contributions from a range of participants. Published by Pen & Sword Books Limited at £25 rrp, it has 300 pages and over 110 illustrations, most in colour. The book is focused on the new breed of RAF helicopter pilots, recruited straight from the sixth form to officer and pilot training, and sent on their first flying-tour to the action in Borneo – called upon to fly over the confusion of jungle warfare, far away from home. The reader will share their daily adventures, learning trajectories and camaraderie and how, thrown in at the deep end, the ‘Borneo Boys’ quickly became men. All the excitement of the aviator’s adrenaline ride is translated into elegant prose, strengthened by the kind of confident delivery achievable only by a man who was himself involved in the action. A fascinating book for those with a passion for helicopter flying and general aviation alike. When asked about his motivation for writing the book, Roger told Airscene “In the summer of 2010 I was giving a presentation to the helicopter crews of RAF Benson on the Borneo Campaign, based on my 2006 book on the air-supply. As I usually do, I asked whether anyone in the room had heard of the campaign, Indonesian Confrontation having been such a low-profile, clandestine affair. To my surprise, two chaps of about my age in the front row raised their hands – they not only knew about it but also served in it, as very youthful Whirlwind pilots. Over the last decade David Bent’s modern and distinctive style of aviation art has won a plethora of devoted fans including the Red Arrows, with whom he has collaborated as Artist in Residence. Big, bold and captivating – whether wittily subverting the destructive power of nuclear arms race, celebrating the sheer joy of pilots in flight or enticing the viewer to work out the hidden imagery contained within his works – David Bent’s style is considered by many to be a breath of fresh air for aviation art. In conjunction with RAF and Ministry of Defence, this is an exciting display of winning photos from currently serving men and women in the RAF. The exhibition as a dynamic birds eye view from inside the RAF. Celebrating and highlighting the RAF’s achievements in Oman. The exhibition will include first-hand accounts, documents, uniforms and equipment detailing the long standing relationship. The Royal Air Force Museum London will be launching in summer 2013, a signature exhibition commemorating and celebrating the national institution that is Airfix. This exhibition will chart the history of this Great British Institution by displaying original Box Art as well as Airfix’s most popular models from the 50s, 60s and 70s in the Museum’s Art Gallery. The Museum has a dedicated exhibition area featuring a specially made film, a recreation of the Barnes Wallis office and a life size bouncing bomb. It will also be displaying items from its archives such as Guy Gibson’s DFC and log book. Other commemorative events will include a concert underneath the Lancaster, a 4D Dambuster experience, special podcasts and a model show (see website for full listing). Curators from the Royal Air Force Museum have selected 100 artefacts from its rich and diverse First World War collection. Each object is specifically selected to tell a story about the experiences of those men and women, at home and overseas, who lived, fought, worked & died during this cataclysmic period. You are invited to tell us which objects and their stories you find the most inspiring. The Museum celebrates our finest hour with film screenings, outdoor re-enactments, temporary exhibitions, special tours and military vehicles. The Museum celebrates the Afro-Caribbean contribution to the RAF – the first service to instigate an equal ops policy. Beginning with WWI through to WWII and The Cold War to currently serving members, the exhibition will include personal recollections, photos and more. RAF Museum curator Andy Simpson recently followed a trail from Colindale to Stanbridge and unearthed a rare wooden carving once owned by Claude Grahame-White. The carving which is in the shape of the Grahame-White logo, was built around 1916 and used as the central motif of the large electrical panel currently on display in the Watch Office at the Museum in Colindale. After WWI the site was handed over to the War Office and became an RAF station (RAF Hendon). At some point in the site’s history, the carving was mysteriously removed. Following on from this Mr Simpson met representatives from RAF Stanbridge who were only too happy to return the carving along with other items so that it could be displayed in its rightful place. The carving is currently at the Museum’s site in Cosford undergoing restoration work by our National Award winning apprentice Laura Pringle and will be on display at the Museum in Colindale next year.